The Deluxe Building Brick Extension Set includes four building brick bases that fit into the four module ports on KIBO’s body, plus a purple building brick version of KIBO’s famous Art Platform. Students can use one, two, three, or all four of these building brick bases to build fabulous structures onto their KIBO body, while mixing and matching any combination of Sensor Modules and brick bases. 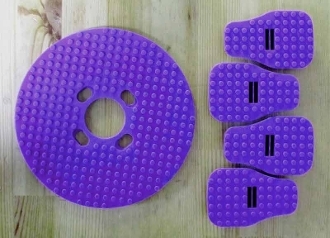 Or students can make a stationary or spinning building brick creation with the two-­sided purple Art Platform. Extension for KIBO 14, KIBO 18, and KIBO 21 sets only. For KIBO 10, we suggest the Basic KIBO Building Brick Extension Set.